Its been ages since I had planned to try out Keema Balls and every time something comes on way and I postpone it. And I have also been telling hubby dear that I will prepare this one day. I guess he got fed up hearing me say it so many times, yet never really do it. Then I misplaced the recipe that I had with me. Which lead me browse for something similar. He said no to anything that's very rich. Because that's how it ends up. I end up preparing something so rich that it becomes too heavy. He has always been talking about his aunty who prepares an excellent Keema balls gravy in a jiffy. I have had enough of that story that I wanted him to talk about mine. When I told him that it might require frying and then adding to gravy. He said it was so simple that it used to get ready so soon. So again I searched to check if I could find something that does require lot of frying and spending much time. I came across few that were sounding good. Finally I adapted Sailu's as I know if she has prepared, it got to be good. So this weekend, Keema Balls in coconut poppy seeds gravy is what I prepared for Sunday lunch. Every Sunday, I like to feast on Rasam or Podi annam as I normally don't get to eat that on regular days. This time, hubby dear wanted me to also have something special. My father in law who was visiting us this weekend, got the green chillies from my sil place. Athamma made Vankaya Pappu along with Green Chillies bajji. They were super duper combination. All of us had a fantastic lunch. Thank you Sailu for a wonderful recipe. 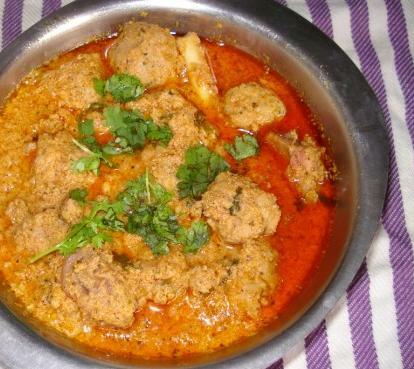 Konda actually liked this so much that I am planning to prepare it again. For the koftas, clean meat and drain well. I left it aside for 40 mins, so it was completely dry when I took it for making the balls. To that add all the other ingredients. Run this in a mixer to get a smooth paste. Remove and prepare small lemon sized balls. For the paste, heat oil in a pan and add the coconut and sauté for a few mts, then add the poppy seeds and sauté further for another 2 mts. Finally add the chopped onions and fry till they are golden brown. Remove from fire and keep aside to cool. Grind to make a fine paste. To make the gravy, heat 1 tbsp oil in a pan, add the ground paste and cook till it turn brown. Then add ginger garlic paste, green chillis, red chilli pwd, salt and curds and combine well. Add 2 cups of water and let it come to a boil. Reduce heat and cook for 3-4 mins. 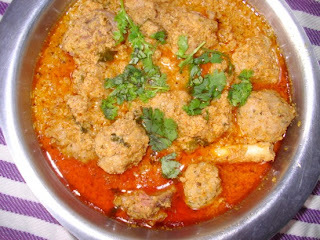 Add the koftas to the gravy and cook them covered on low flame for 20 to 30 mins or till its cooked. 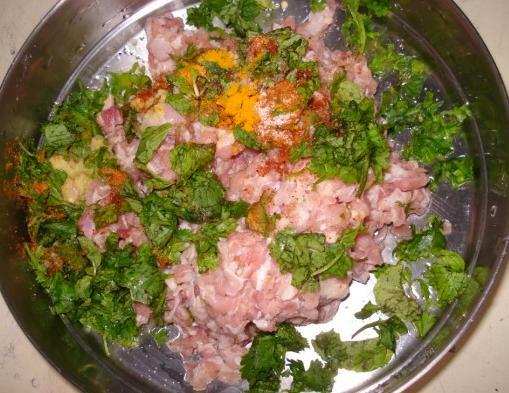 Finally add garam masala pwd, chopped coriander and mint leaves. Cook for another 5 mins on low flame or till you get the thick consistency. Adjust and add 1/2 juice of lemon and mix well. I served this with plain rice. Hubby dear felt he needed some more spice but my daughter just loved the soft koftas mixed in the species. She may have thought it to be paneer as these days she is so fond of it. This is a must for another try.